This instance was one of many wake-up calls throughout my life when my writing was changed due to some forceful, sometimes insulting but truthful wake-up calls. This was truly a time in my life when I learned to stop writing for myself, and start writing for my audience. Being a hotshot, of course I resisted this criticism at first. Clearly, my professor was just unworthy of understanding my genius, right? Well, no—it turns out she was completely right. My writing was clever, full of smart allusions and phrases that certainly gave the impression I was well-read on the topic, but often ended up being irrelevant to my main argument or claim. My word choice was, in Shakespeare’s famous words, lots of sound and fury signifying nothing. More recently, writing a book about rap music for children has helped me hone my style even further. It was at first very difficult for me to write for a sixth to eighth grade reading level, which requires a certain simplicity of word choice and a word cap on sentence length. At first it became very difficult to explain certain terms and ideas in simple language, but my struggle made me better again at boiling down my writing to its barest, most necessary essentials. A strange thing has happened to me over time: Even with all the restrictions and rules of academic writing, my creativity did not feel stifled. In fact, it felt liberated. Over time, I slowly learned the rules of literary analysis and close textual reading. Instead of using jargon-heavy “academese,” I used direct and simple language that clearly followed from sentence to sentence. I felt my thinking and writing was becoming clearer. By the time I was in grad school, I was putting all these lessons into practice and consequently, producing a lot more interesting work. The result of this continual renewal process is that my writing is much, much better than it was even a few years ago, and it comes down to word choice. This is what makes certain writers like Ernest Hemingway worth teaching, in my opinion. Many a high school composition teacher has used Hemingway as the model of a good writer, but the more important element is that he is a profoundly simple writer—he almost completely eschewed adverbs or extraneous adjectives. He may not be a model for every type of writer, but he was a great model for my type of writer—someone who can write a lot and was easily self-impressed by lengthy sentences and big words. A common Hemingway sentence is something like, “He sat and drank his beer.” Another writer might compose something like “He reposed at an acute angle in his favorite chair from childhood and drank a beer from a cold glass with a straw.” At one time, I would have written something like the latter sentence. Now, I see the former sentence as better. Good word choice to me is always about simpler word choice, and it is a lesson I believe I will continue to keep learning. 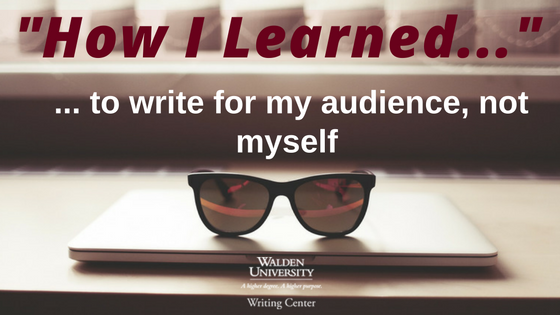 Nathan Sacks is a writing instructor in the the Walden University Writing Center. He also enjoys writing books, playing guitar, and playing with cats.. I am struggling with writing on a scholarly level, this post was very helpful. Hi Nathan! Your experiences were quite funny. I had teachers like you that destroyed my papers for not elaborating enough. I hated writing because it was so subjective. I think that's why I chose the science route. And like you I have evolved to adjust to my audience. Thank you for sharing. Thank you for reading, KKing!